Why is growth in Europe so low? Image: The Euro currency sign is seen next to the European Central Bank (ECB) headquarters in Frankfurt. REUTERS/Lisi Niesner. “Growth is too low everywhere in Europe”. In 2015, ECB President Mario Draghi thus bemoaned Europe’s systematically dismal economic performance. Over the preceding eight years, EU GDP had expanded by 2%, compared to more than 9% in the US. Why was Europe's crisis-induced recession so severe, and why has the subsequent recovery been so weak (Wren-Lewis 2015)? Many factors have contributed to this transatlantic divergence. Among others, economists point to Europe’s ageing population, monopolistic firms, and public policy failures as proximate causes. In recent work, we highlight the additional role played by financial structure (Langfield and Pagano 2016). Firms in Europe are known to rely mostly on banks to fund inventory and investment, in contrast to their US counterparts. To see this, one can measure financial structure by the size of the banking sector relative to the size of equity and bond markets – what we call the ‘bank-market ratio’. Figure 1 plots this ratio over the past 100 years. Since 1960, Germany and the UK – along with the rest of Europe – have become more bank based than the US, with this divergence accelerating in the 1990s. A similar picture emerges when financial structure is alternatively measured from the perspective of firms’ liabilities (rather than banks’ assets), using national financial accounts data. In the Eurozone, two-thirds of firms’ external funding comes from loans, compared with just 20% in the US. Source: Langfield and Pagano (2016). But does this transatlantic divergence matter? Many economists take the view that financial structure just reflects other phenomena, such as the structure of the real economy, so it exerts no independent effect on long-run economic growth (e.g. Allen and Gale 2000). Indeed, upon analysing 1980-95 World Bank data, Levine (2002) concludes that “neither bank-based nor market-based financial systems are particularly effective at promoting growth”. But Levine’s empirical conclusion does not hold for more recent data. Using data up until 2011, Pagano et al. (2014) re-estimate the exact specifications estimated by Levine and find that more bank-based financial structures are conditionally associated with lower economic growth. Recent work by Hsu et al. (2014) and Cournède and Denk (2015) draws similar conclusions. In our paper (Langfield and Pagano 2016), we extend this emerging body of evidence on the negative growth effects of bank-based financial structures in recent decades. In our empirical set-up, the dependent variable is growth in real GDP per capita, averaged over five-year intervals. The independent variable of interest is the ‘bank-market ratio’. We estimate panel regressions with country-level fixed effects and time dummies. In some specifications we also control for the potential endogeneity of financial structure by instrumenting it with past reforms of financial regulation. Across specifications, we find that an increase in the size of a country’s banking sector relative to stock and private bond market capitalisation is associated with lower GDP growth in the subsequent five-year period, controlling for time and country effects. We also examine whether this negative effect of bank-based intermediation on growth is amplified during periods of financial stress. Since banks are highly levered, their equity value is sensitive to changes in asset prices. When asset prices drop, banks are forced to cut back on lending – more so than market-based finance, which is less levered and therefore less procyclical. Recent empirical work highlights this role of securities markets as a ‘spare tire’ – compensating for the collapse in bank lending during crises (Becker and Ivashina 2014, Gambacorta et al. 2014, Levine et al. 2015). To test this ‘amplification hypothesis’, we interact the bank-market ratio with two dummies in separate regressions: a ‘housing market crisis’ dummy (equal to 1 if real house prices drop at an average annual rate of at least 5% over five years, and 0 otherwise); and a ‘stock market dummy’ (equal to 1 if the domestic stock market index drops at an average annual rate of at least 10% over five years, and 0 otherwise). We estimate a negative and significant coefficient of the interaction between the bank-market ratio and the housing market crisis dummy, but not for the interacted stock market crisis dummy. 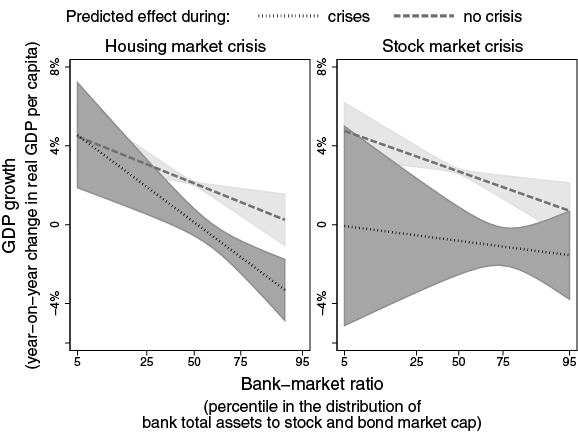 In other words, bank-based financial structures amplify the recessionary impact of housing market crises only – a finding that reflects the importance of mortgage lending in banks’ balance sheets (Jordàet al.2016). Figure 2 plots the predicted effect of countries’ bank-market ratios on subsequent GDP growth, with the dashed and the dotted lines showing the growth-reducing effect of the bank-market ratio in normal times and during crises, respectively. To appreciate the economic magnitude of these effects, consider the following. In 1990, Europe’s bank-market ratio was equal to 3.2; by 2011, this ratio had increased to 3.8. According to our estimates, such an increase is associated with a slowdown in the annual growth rate of 0.3 percentage points in normal times and 0.6 percentage points during housing market crises. If instead bank system assets had grown at the same rate as GDP from 1990-2011, everything else being equal, the bank-market ratio in the median European country would have fallen to 1.7 in 2011 (owing to the rise in stock and private bond market capitalisation). According to our estimates, this hypothetical decrease in the bank-market ratio would have been associated with higher annual growth of 1.3 percentage points in normal times and 2.4 percentage points during housing market crises. What explains the changing relationship in the data between financial structure and economic growth since the early 1990s? 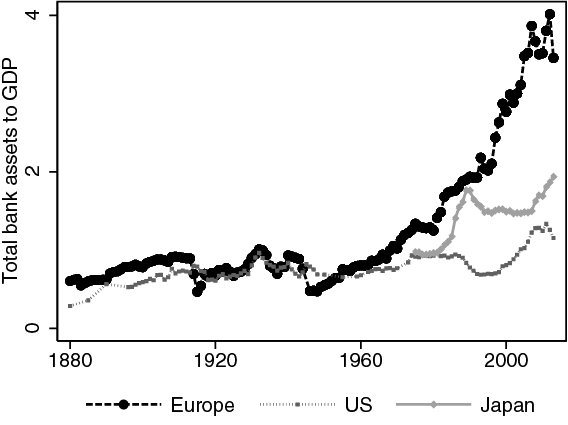 This period coincides with the period over which Europe’s banking system became extraordinarily large (see Figure 3). Asking ‘whence the new result?’ therefore amounts to asking why Europe’s banking system grew so much between the mid-1990s and 2012. Real economy structure did not change much over those two decades, so the explanation must lie elsewhere. Sources: see Langfield and Pagano (2016). The ‘Europe’ series represents the median of bank total assets to GDP in the seven European countries for which reliable long time series data are available: Belgium, Denmark, Germany, Italy, the Netherlands, Spain, and the UK. By way of explanation, we turn to public policy, and to the regulation and supervision of banks. Moral hazard in banking is a global challenge for banking regulators, but the response of Europe’s policymakers and bank supervisors to moral hazard before the Global Crisis was particularly weak. Governments treated ‘national banking champions’ leniently (Véron 2013); bank supervision was lax (FSA 2008, Honohan 2010) and subject to political interference (Hau and Thum 2009, Garicano 2012); and, until recent regulatory innovations, Europe lacked a credible resolution regime. As a result, Eurozone banks, and to a lesser extent UK banks, benefited from a greater reduction in funding costs owing to government support than US banks, as shown by the IMF. Our empirical findings in Langfield and Pagano (2016) support the view that weak bank regulation and supervision contributed to the extraordinary growth in Europe’s banking system relative to its capital markets. At the European Parliament in November 2014, Mario Draghi stated that it is “better to have a plurality of channels financing the real economy than to rely on just one”. Public policy has vast influence on economies’ financing mix; just as policy mistakes distorted the size of Europe’s banking system over 1995-2012, enlightened policy can generate a more balanced financial structure in the future. Reassuringly, policy is now heading in the right direction. Moral hazard in banking is mitigated by improved bank regulation and resolution frameworks; in the Eurozone, supervision and resolutionpowers now reside with supranational authorities. In parallel, the EU Commission has committed to delivering a European ‘capital markets union’ (CMU), with the intention of developing pan-EU securities markets to “reduce Europe’s very high dependence on bank funding” (Juncker 2014). The empirical findings presented in this column suggest that the Capital Markets Union can help to end Europe’s sustained period of ‘too low’ growth. The onus is now on policymakers to ensure that the ambition of the Capital Markets Union is matched by action. Allen, F and D Gale (2000), Comparing Financial Systems, MIT Press. Becker, B and V Ivashina (2014), “Cyclicality of credit supply: Firm level evidence”, Journal of Monetary Economics, 62: 76-93. Cournède, B and O Denk (2015), “Finance and economic growth in OECD and G20 countries”, OECD Economics Department Working Paper no.1223. Financial Services Authority (2008). “The supervision of Northern Rock: A lessons learned review”. Gambacorta, L, J Yang and K Tsatsaronis (2014), “Financial structure and growth”, BIS Quarterly Review, March, 21-35. Garicano, L (2012), “Five lessons from the Spanish cajas debacle for a new euro-wide supervisor”, VoxEU.org book Banking Union for Europe, Thorsten Beck (ed.). Hau, H and M Thum (2009), “Subprime crisis and board (in-)competence: Private vs. public banks in Germany”, Economic Policy, 24(60): 701-751. Honohan, P (2010), “The Irish banking crisis: Regulatory and financial stability policy, 2003-2008”. A report to the Irish Minister of Finance by the Governor of the Central Bank. Hsu, P-H, X Tian and Y Xu (2014), “Financial development and innovation: Cross-country evidence”, Journal of Financial Economics, 112(1): 116-135. 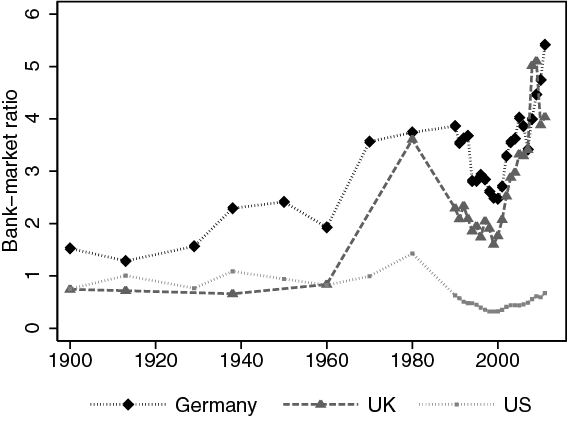 Jordà, Ò, M Schularick and A Taylor (2016), “The great mortgaging: Housing finance, crises, and business cycles”, Economic Policy, 31(85): 107-152. Juncker, J-C (2014), “A new start for Europe: My agenda for jobs, growth, fairness and democratic change”, opening statement in the European Parliament plenary session. Lambert, F J, K Ueda, P Deb, D F Gray and P Grippa (2014), “How big is the implicit subsidy for banks considered too important to fail?” Chapter 3 in Global Financial Stability Report, International Monetary Fund, April. Langfield, S, and M Pagano (2016), “Bank bias in Europe: Effects on systemic risk and growth”,Economic Policy, 31(85): 51-106. Levine, R (2002), “Bank-based or market-based financial systems: which is better?” Journal of Financial Intermediation, 11(4): 398-428. Levine, R, C Lin and W Xie (2015), “Spare tire? Stock markets, banking crises, and economic recoveries”, Journal of Financial Economics, forthcoming. Pagano M, S Langfield, V Acharya, A Boot, M Brunnermeier, C Buch, M Hellwig, A Sapir and I van den Burg (2014), “Is Europe overbanked?” Report no.4 of the European Systemic Risk Board’s Advisory Scientific Committee. Véron, N (2013), “Banking nationalism and the European crisis”, speech at a symposium of the European Private Equity and Venture Capital Association. Wren-Lewis, S (2015), “We already have a simple and conventional story to explain the weak recovery,” VoxEU.org, 30 January.